Previous Live Action News reports have documented Planned Parenthood‘s history of potential fraud in light of half a billion tax dollars being entrusted to the abortion corporation annually. Watchdog organizations like Alliance Defending Freedom and the Charlotte Lozier Institute have published reports showing Planned Parenthood’s blatant disregard for regulations regarding Medicaid dollars. 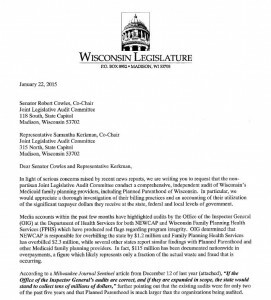 During our visits to family planning clinics throughout the State, many providers (especially Planned Parenthood providers) stated that they billed all claims to Medicaid as “family planning.” Officials at these clinics stated that they believed that all of the services they provided were related to family planning. Therefore, officials at these clinics often populated the family planning indicator field on Medicaid claims even though the service provided did not meet the criteria for 90-percent Federal funding. By populating this field, the MMIS designated the claim as eligible for 90-percent Federal funding. Officials at Planned Parenthood providers stated that they believed that nearly all the services they provide are related related to family planning. However, the medical review determined that the providers improperly claimed, for example, services to pregnant women, treatment for sexually transmitted diseases, and counseling visits unrelated to family planning services. In 2011, the State of New York, Office of the Medicaid Inspector General, sent a letter to Planned Parenthood of the Hudson Peconic, requiring restitution of overpayments of nearly $31,000 after reviewing claims with payment dates of January 2006 through December 31, 2008. 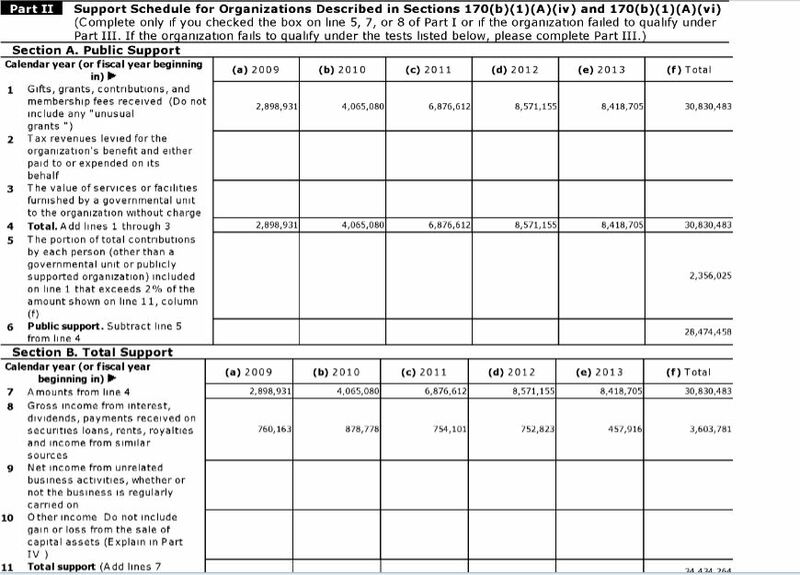 A New York State Office of Medicaid Inspector General audit of Planned Parenthood Hudson Picnic, published in 2011, reviewed HIV counseling paid from July 1, 2004 through June 30, 2007, and found that nearly $2,227,000 was overpaid but only repayment of just over $2 million was required. Out of a random sample of 100 services the IG reviewed, 83 had at least one error and did not comply with state requirements; a number of those contained more than one deficiency. These examples are yet more proof that serious oversight is needed to guard the millions of tax dollars being sent to the nation’s largest single abortion provider every year. Planned Parenthood’s history of fraud even extends to violations with the federal 340B Drug Discount Program, previously reported here at Live Action News and at Townhall. Despite this evidence, and after years of politicians promising to defund this abortion behemoth, Planned Parenthood is again poised to receive another half a billion taxpayer dollars in 2018. Planned Parenthood has been cited for Medicaid fraud… so why is it still getting taxpayer funding? Planned Parenthood has been cited for overbilling abuses and Medicaid fraud, for violating patient privacy, and for failing to report child sexual abuse. So why is the abortion corporation still receiving half a billion dollars a year from taxpayers? A study by the Government Accountability Office (GAO) and Congressional Budget Office (CBO) in 2012 showed that Planned Parenthood received $400.56 million in Medicaid reimbursements (including both federal and state dollars), according to findings published in 2017 by the Congressional Research Service. Planned Parenthood’s own 2015-2016 annual report shows that 41 percent of its funding comes from the taxpayer ($554.6 million). Numbers published in previous Planned Parenthood annual reports indicate its affiliates have received more than $4.5 billion from taxpayers. Yet, with so much tax money at stake, exactly what kind of oversight is being conducted to safeguard more than half a billion tax dollars entrusted to Planned Parenthood annually? According to reports by watchdog agencies, very little. In 2014, the group Alliance Defending Freedom (ADF) published a report identifying 10 types of waste, abuse, and potential fraud Planned Parenthood affiliates have been caught committing or have been credibly accused of nationwide. The potential fraud includes billing while obtaining reimbursements from Title XIX agencies for medications and/or services provided in connection with an abortion. This is illegal. Then, in 2017, a coordinated study conducted by both the Charlotte Lozier Institute (CLI) and Alliance Defending Freedom reviewed a number of additional audits from a variety of agencies. 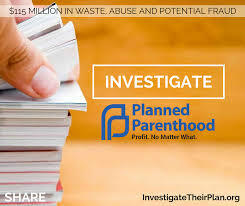 The purpose of the study was to identify waste, abuse, and potential fraud by Planned Parenthood among its now 57 separately incorporated affiliates, and other abortion and family planning facilities, particularly with respect to federal and state Title XIX-Medicaid programs. A large and growing number of federal and state audits have documented that improper practices by Planned Parenthood and state family planning agencies have already resulted in losses to the American taxpayer of nearly $132.4 million, at a minimum, in Title XIX-Medicaid and other healthcare funding programs. The report notes that “[…] auditors and investigators have specifically identified Planned Parenthood affiliates as the source of at least $12.8 million in waste, abuse, and potentially fraudulent overbilling and penalties…” and that “[t]hree federal audits specifically identify Planned Parenthood – and only Planned Parenthood – as the problem in state family planning program overbilling,” the report states. The groups pointed out that the audits they reviewed were limited in scope, suggesting the possibility for millions of additional taxpayer dollars to be wasted or fraudulently overbilled. “For example, an audit may examine only one type of billing, for one type of product, for one clinic in a single year. Yet nearly every known audit of Planned Parenthood affiliates and of state family planning programs has found overbilling,” the report notes. “In New York, alone, during one four-year audit period, it appeared that hundreds of thousands of abortion-related claims were billed unlawfully to Medicaid,” ADF’s Mattox told a Congressional hearing on the topic in 2015. [The] Medicaid statute provides grounds for which the U.S. Department of Health and Human Services, in its discretion, may exclude a provider. These include claims for excessive charges, unnecessary services, or services which fail to meet professionally recognized standards of health care; fraud, kickbacks, and other prohibited activities; entities controlled by a sanctioned individual; failure to disclose required information, supply requested information, or supply payment information; sanctioned individuals controlling an entity; and making false statements or misrepresentations of material fact. […] Planned Parenthood is unlike many other Medicaid providers. Not only has it had great financial success as a Medicaid provider, but also it has been able to avoid much of the oversight and/or corrective action that most Medicaid providers would expect and have received. The continued misuse and fraud of American tax dollars by Planned Parenthood is unacceptable. When will it stop? Read the full report detailing Planned Parenthood’s potential fraud and waste of taxpayer funding here. The Governor of the State of Texas said he hopes Planned Parenthood files legal action against their move to cut off Medicaid funding to the abortion biz so he can put their officials under oath. 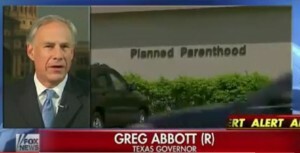 Newly elected Governor Greg Abbot told Fox’s Bill Hemmer that in Texas, Planned Parenthood has very serious issues that violate federal law. “One, the Inspector General says he has evidence showing that Planned Parenthood altered the abortion procedure in order to obtain fetal tissue. This violates federal law as well as state law,” Gov. Abbot said. That fact was detailed in several undercover videos published by the Center for Medical Progress. 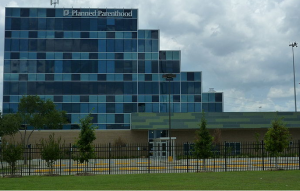 One of the clinics that CMP filmed was a Planned Parenthood mega center in Houston. “Third…the fact that Planned Parenthood has already previously been found in violation of Medicaid fraud for billing for items and services that were either unnecessary or never provided. And, the Inspector General says he has uncovered more instances of these types of violations,” the Texas Governor added. Days ago, Live Action News detailed these Planned Parenthood Medicaid fraud cases in a report you can read here. When asked to respond to Planned Parenthood’s charge that this move by the state is a “scandal” Abbott called it “cover for the very serious violations they face.” He accused Planned Parenthood of bilking the taxpayers of the State of Texas and the US out of money which they did not deserve. He pointed out that there are thousands of places where women can receive the health care they need through the Medicaid Program. Asked if he expected a legal challenge, the Texas Governor responded, “I hope for a legal challenge here because I want to put these Planned Parenthood officials under oath and get them to swear about the practices that they were conducting in the state of Texas. Abbott then reiterated that the State’s legal actions would have occurred without the CMP videos. 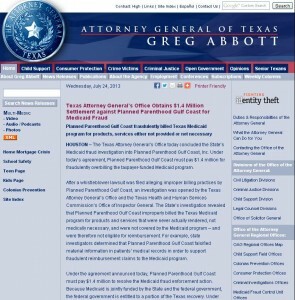 “Texas does have hard evidence showing Medicaid Fraud,” Governor Abbott stated. 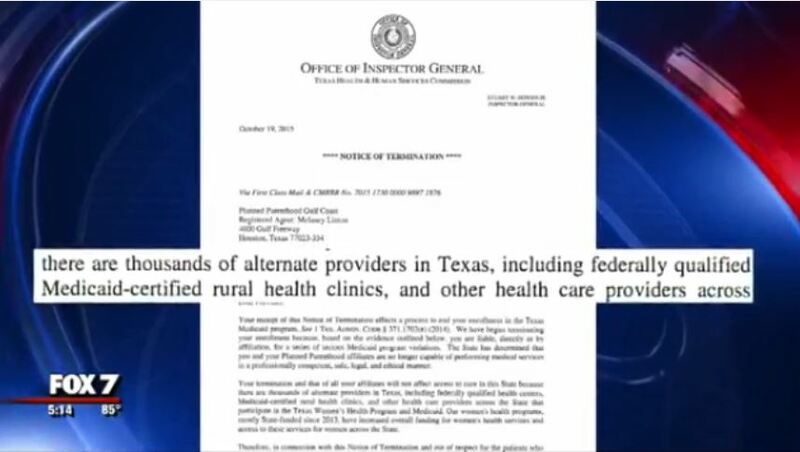 Hours after this interview, the state raided several Planned Parenthood centers serving subpoenas on Planned Parenthood centers in Houston, Dallas and San Antonio. Read Live Action News’ report in this here. Planned Parenthood clinics in Texas received $3.05 million in federal funds through Medicaid for family planning services last year, according to a report in the Texas Tribune. In the 2013 case mentioned in the letter, the state had accused Planned Parenthood of submitting more than $30 million in fraudulent bills between 2003 and 2009. In addition to the Reynolds case, in 2014, another whistle-blower case alleged that PPCG defrauded Medicaid with regard to blood tests performed on Texas teens. 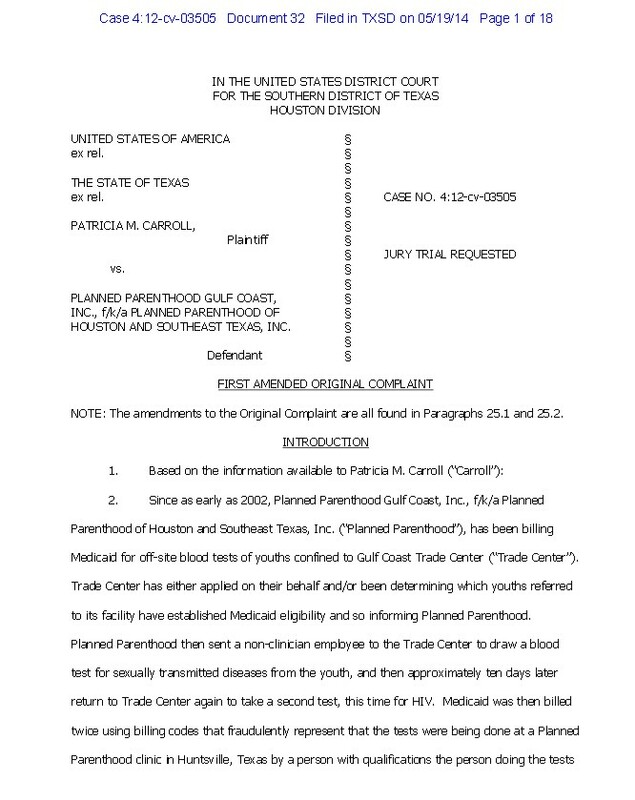 The case was brought by Patricia Carroll who served for several years as the accounts receivable manager for Planned Parenthood Gulf Coast. The complaint stated that Carroll noticed “a large revenue increase” of 314.76% for a Planned Parenthood clinic in Huntsville while preparing the monthly projection report. But, while the media publishes Planned Parenthood’s faux outrage the organization’s mother ship in the state, PPCG is hardly lacking financially. According to Planned Parenthood Gulf Coast’s most recent 990 report the Houston abortion business netted over $43 million dollars in assets by the end of 2013. 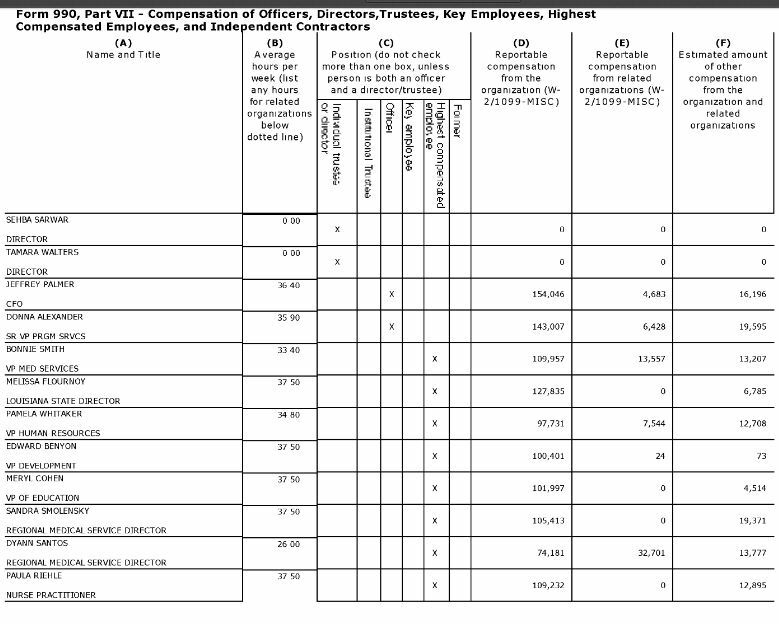 In addition, 10 out of 11 officers or staff listed on the Planned Parenthood report made a hefty six digit salary. PPGC’s statement of revenue shows $8,941,664 in total revenue that year which included $920,368 in government grants and $7,577,972 in contributions, gifts, and other grants. And, between 2009 and 2013, PPGC reported receiving $30,830,0483 in gifts, grants or contributions earning a whopping $3,603,781 in interest, dividends, and other investment income. In other words, Planned Parenthood Gulf Coast alone potentially earns as much revenue in interest as the amount the state of Texas is pulling through the state Medicaid program. So, when Planned Parenthood claims that women will be hurt by the mere $3 million state dollars the taxpayers will no longer have to pay through Medicaid, they are misleading the public. Saynsumthn has been blogging about Planned Parenthood’s Medicaid Fraud for a while, so when they claim these states (below) are conducting a war on women, set the record straight. A third state has terminated the Medicaid contract they held with Planned Parenthood following videos exposing their baby parts operation. Earlier this week, New Hampshire’s Executive Council voted, 3 to 2, to reject contracts that would have provided Planned Parenthood centers in the state with about $638,000 over two years, roughly one-third of the public funding for the centers, which is primarily federal. In rejecting the contract, Republican councilors cited recently released videos by anti-abortion activists showing the organization’s officials discussing providing medical researchers with tissue from aborted fetuses. Conservatives are alleging that the organization is profiting from selling fetal tissue, a charge it denies. Planned Parenthood of Northern New England does not engage in the voluntary tissue donation program, but the Republican councilors told Gov. Maggie Hassan the state should launch a state-based investigation. “You can’t divorce what’s going on nationally from Planned Parenthood of Northern New England and we need a real investigation,” said GOP Councilor David Wheeler. 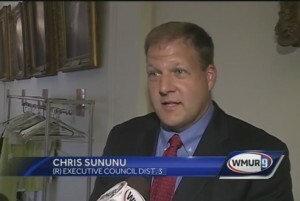 Republican councilor Chris Sununu who previously voted to support Planned Parenthood contracts said that he is pro-choice on abortion but he received more than 1,000 messages from constituents who overwhelmingly urged him to reject the contract. “Things are different now. We have to take a step back and just take a pause and say ‘Is this a company and a business that we should be actively engaging (with)? '” he asked. Also pulling funding was Louisiana Gov. 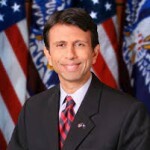 Bobby Jindal who announced that his state cut off Planned Parenthood from Medicaid funding August 3rd. According to the announcement, the Louisiana Department of Health and Hospitals informed Planned Parenthood it was exercising its right to terminate Planned Parenthood’s Medicaid provider agreement, the press release stated. Governor Jindal said that, because of the videos, he directed DHH to investigate Planned Parenthood’s activities in Louisiana and also sent a letter to both the Louisiana Inspector General and the F.B.I. asking them to assist in the investigation. “In recent weeks, it has been shocking to see reports of the alleged activities taking place at Planned Parenthood facilities across the country. Planned Parenthood does not represent the values of the people of Louisiana and shows a fundamental disrespect for human life. It has become clear that this is not an organization that is worthy of receiving public assistance from the state,” the 2016 presidential candidate said. 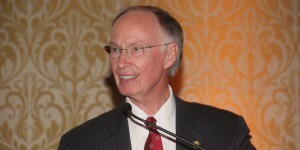 In addition to Louisiana and New Hampshire, today republican Alabama Governor Robert Bentley has announced that the state has terminated their Medicaid contract with Planned Parenthood. 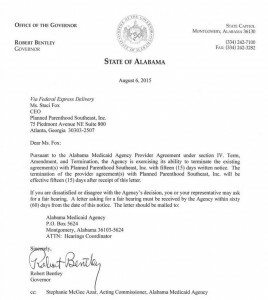 Yellowhammer obtained a copy of the letter sent to Planned Parenthood CEO Staci Fox. “The nation is shocked by videos depicting Planned Parenthood employees callously discussing the dismemberment of babies and the sale of baby body parts for profit. This is like a story out of Nazi Germany,” said Sen. Bill Hightower (R-Mobile) during the committee hearing. 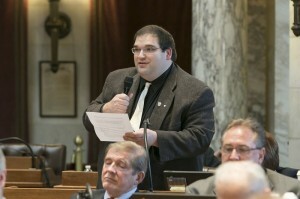 Sen Hightower also introduced legislation in the state that will make it a felony to offer or accept money for aborted babies, “Because if the feds don’t deal with it, we will,” he added. An Alabama Senate committee approved the bill today which will now move to the full Senate. Alabama Congressman Bradley Byrne is now calling on the Department of Justice to investigate Planned Parenthood. Last month, Life Dynamics reported that a Wisconsin lawmaker introduced a bill that could eliminate at least half of the funding Planned Parenthood gets in the state by reducing over-billing through Medicaid by the abortion giant. The legislation came following calls from 24 lawmakers asking for a Planned Parenthood audit. “I already sued Planned Parenthood for Medicaid Fraud. Now Texas will look into these organ harvesting claims,” the Governor tweeted. 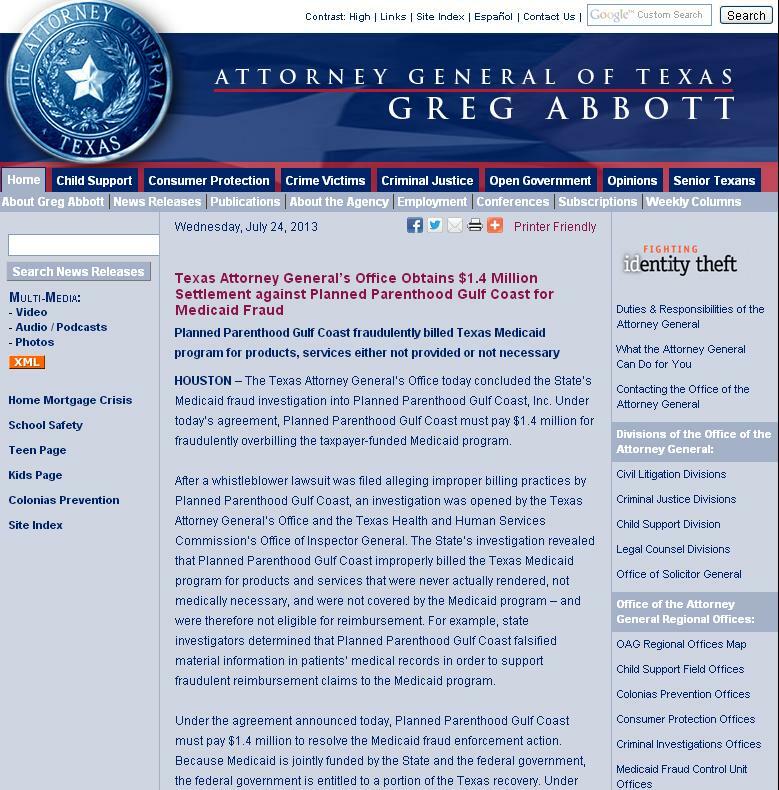 According to the Houston Chronicle, on July 30,2013, Planned Parenthood Gulf Coast settled fraudulent Medicaid billing lawsuit with the state to the tune of $4.3 million – nearly $3 million more than was originally announced by then Texas Attorney General Greg Abbott. Americans United for Life has also documented alleged abuses by Planned Parenthood. A 2014 report by the legal group, Alliance Defending Freedom, entitled, “Profit No Matter What,” makes similar claims. 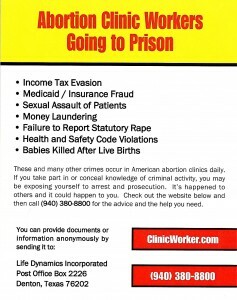 Through Life Dynamics’ Clinic Worker project, employees of Planned Parenthood can report fraud and other illegal activity. For a Clinic Worker kit that you can use outside your local abortion and Planned Parenthood facility, contact Life Dynamics. A lawmaker in Wisconsin has introduced two bills that could eliminate at least half of the funding Planned Parenthood gets in the state. 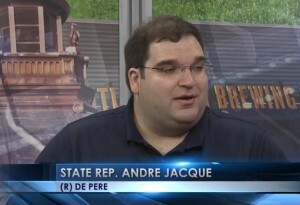 Rep. Andre Jacque is co-sponsoring legislation that will require family planning clinics, most notably Planned Parenthood, to bill Medicaid at the actual acquisition cost when they acquire drugs at the heavily discounted rates available through the Medicaid 340B program. Jacque contends that providers like Planned Parenthood, which gets over half a billion in taxpayer monies annually, are inflating rates, sometimes “eight times” the actual cost. The bill would limit providers to a “reasonable” dispensing fee, which Jacque estimates would reduce funding by about $4.5 million. “This change will bring Wisconsin in line with the majority of other states and save millions of taxpayer dollars,” he said. The 340B Drug Discount Program is a federal government program created in 1992 that requires drug manufacturers to provide outpatient drugs to eligible health care organizations/covered entities at bargain basement prices. Wisconsin is one of the most “generous” states in the country in terms of its relatively high allowed Medicaid reimbursement rate with state and federal taxpayer dollars for family planning providers through the 340B Program. “Planned Parenthood of Wisconsin has publicly claimed that eliminating their overbilling of taxpayers for drugs acquired through the 340B program would result in a $4.5 Million annual reduction in their subsidy by taxpayers,” Rep. Jacque claims. The legislation follows a request submitted by 28 Wisconsin State Representatives and 4 State Senators in January calling for an investigation into family planning centers and Planned Parenthood centers in the state. 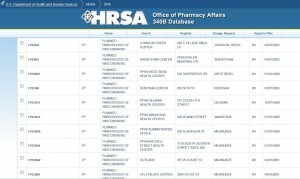 Recently a HRSA audit conducted on Planned Parenthood of Western Pennsylvania, revealed “Duplicate discounts” in the 340B Medicaid program. An HRSA audit in 2013 identified a duplicate discount finding for Planned Parenthood Hudson Peconic, Inc. that could potentially result in PPHP owing repayments to manufacturers. Earlier this year, Wisconsin Representative Sean Duffy introduced a bill into the U.S. House which would stop abortion providers from “unbundling” abortion services so they can submit separate claims to Medicaid. “All too often, abortion providers – such as Planned Parenthood – are able to line their pockets with taxpayer funds by using a complex billing system and taking advantage of programs that rely on provider integrity for compliance,” Rep. Duffy pointed out at the time. Wisconsin state representative Jacque told WRN that another one of the bills he is sponsoring would “reprioritize” about $3 million in federal grant money that Planned Parenthood received by having the state Department of Health Services apply for the funding. “There are any number of better public health opportunities that we have, than Planned Parenthood,” he pointed out. The bills seek to reduce $7.5 million in federal funding at Planned Parenthood facilities across the state. A 2014 report conducted by Alliance Defending Freedom outlined abuse and potential fraud by Planned Parenthood affiliates across the country as well as other abortion providers, particularly with respect to federal and state Title XIX-Medicaid reimbursements. Nationally, Planned Parenthood has come under fire for the harvesting of aborted baby parts after the group, Center for Medical Progress published two videos of top Planned Parenthood officials bragging how they procure livers, hearts, lungs, and other organs from the children they abort. It was recently made public that Planned Parenthood’s Senior Director of Medical Services, Dr. Deborah Nucatola, seen in the undercover video above talking about where she will “crush” a little child in the womb to preserve specific organs, is a University of Wisconsin Madison graduate. The University has been criticized for their promotion of fetal tissue research. 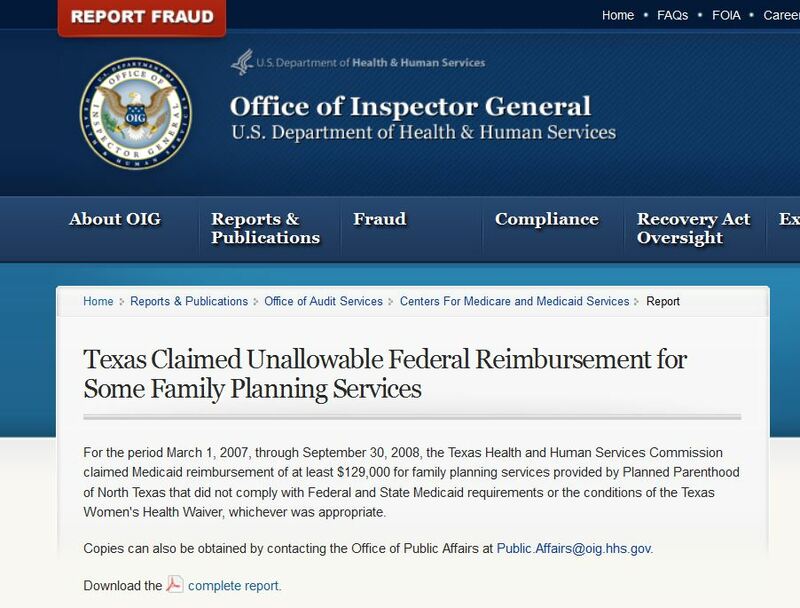 The Department of Health and Human Services, Office of the Inspector General, conducted a review which covered 3,251 clients with claims for Medicaid family planning services (Medicaid services) that Planned Parenthood of North Texas ( PPNT ) submitted, totaling $493,112 ($443,800 Federal share), during the period March 1, 2007, through September 30, 2008 (audit period). 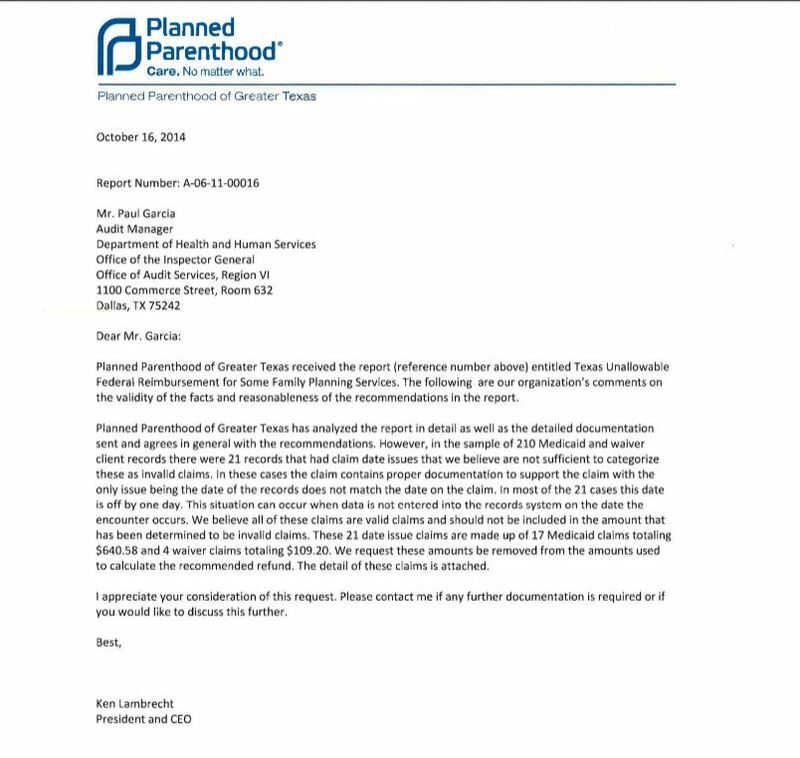 The IG conducted their field work at Planned Parenthood locations in Dallas and Ft Worth. The review also covered 5,548 clients with claims for waiver family planning services (waiver services) that PPNT submitted totaling $800,000 ($720,000 Federal share), during their audit period. They selected a stratified random sample of 105 clients from each of these client populations. They then reviewed the services and determined the unallowable Federal share of the payments made. The State agency did not always claim Medicaid reimbursement for family planning services provided by PPNT in accordance with Federal and State Medicaid requirements or the conditions of the waiver, whichever was appropriate. 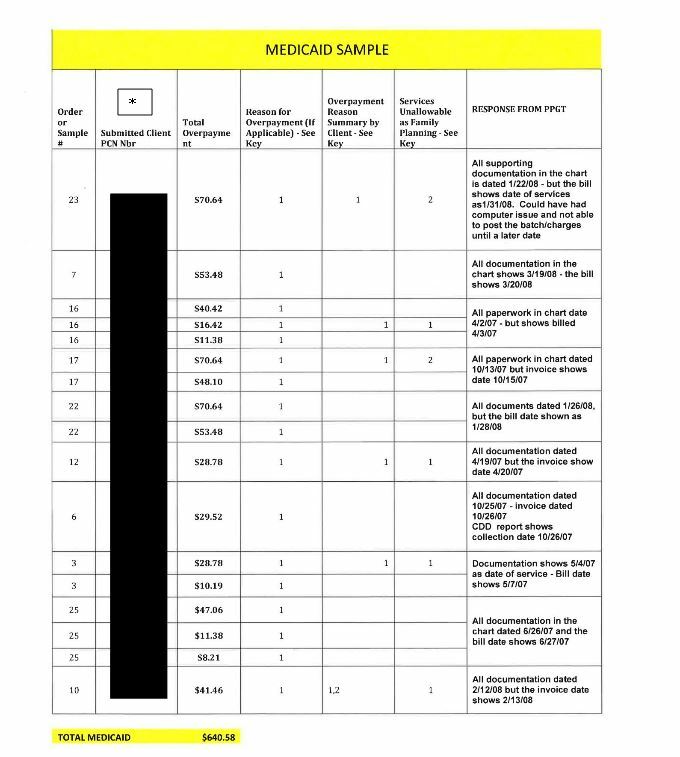 (3) 5 Medicaid client records contained 1 or more deficiencies (totaling $104) on services unrelated to family planning. (3) services claimed had a family planning purpose. As a result of these errors, the State agency incorrectly claimed a total of $7,651 for Medicaid and waiver services. On the basis of their sample results, the IG estimated that the State agency improperly claimed a total of $129,028: $67,019 for Medicaid services and $62,009 for waiver services. The agency is now recommending a refund of $129,028 to the Federal Government: $67,019 for Medicaid services and $62,009 for waiver services that did not comply with Federal and State requirements for family planning service. Providers must keep records to fully disclose the extent of services provided to Medicaid beneficiaries. Additionally, all Medicaid records must be kept for 5 years from the date of service or until all pending audit questions are resolved, whichever is longer. Records and supporting documentation must be made available upon request to the Texas Department of Health or its designated agent. For 50 of the 105 Medicaid clients in the IG’s sample, PPNT did not have the required supporting documentation for at least 1 family planning service. For 39 of the 105 waiver clients in the sample, PPNT did not have the required supporting documentation for at least 1 family planning service. For example, all of the medical records for the dates of service were missing, or the records did not have sufficient information to support the services claimed. These errors occurred because the State agency did not ensure that PPNT maintained the appropriate required supporting documentation for family planning services. As a result, the State agency improperly claimed $3,983 for Medicaid services and $1,855 for waiver services. The Medicaid program pays for services provided to a client only when the extent of the services is fully disclosed. According to the official coding guidelines,billing codes are determined using several components, including client’s history, examinations, medical decision making, counseling, coordination of care, the nature of the presenting problem, and the amount of time spent with the client. For 23 of the 105 Medicaid clients in our sample, at least 1 family planning service was incorrectly billed. Examples of this type of error included billing an incorrect office visit code when the client received only a birth control injection, billing a counseling code in addition to another code that already included the counseling, or billing for a service that was claimed during a previous visit and that was not allowed to be billed again. The State agency said that it would collect the overpayment from Planned Parenthood North Texas and refund the Federal share. Details of other Planned Parenthood state and federal audits are linked at this blog post (here).